Last week I had the pleasure of hosting 13 visitors from Portland, Oregan, USA. Foreign visitors are always lovely but this group were far from tourists. All of them were here for a single purpose: to survey and study our bike culture with the aim of gaining knowledge and inspiration for Portland. It wasn't just any ragtag group of Portlanders. It was an impressive army of dedicated and eager Portlanders. The Director of Portland Parks and Recreation. A senior advisor to the President of the Portland Metro Council. A professor in urban planning. 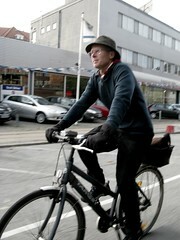 The executive director of the Bicycle Transportation Alliance - an advocacy group. A manager of the planning, parks and trails development division. A corporate giving manager for a sportswear company. The owner of Portland's largest chain of bike shops. I find it amazing and impressive that such a group made the trip to Europe in order to exchange ideas and to find inspiration. Portlanders should be proud that they have such dedicated citizens working for a better bicycle future. The group visited Amsterdam for a few days and spent a few days in Copenhagen. Both cities are inspiring to visit when studying bike culture and infrastructure. I have always felt, however, that Copenhagen can provide much more detailed inspiration in that the city's layout is more similar to American cities. In addition, the traffic culture here is more North American in its mindset. There is order on the bike lanes and little traffic anarchy and it has always struck me as a mentality that is more recognisable to North Americans or the Brits. 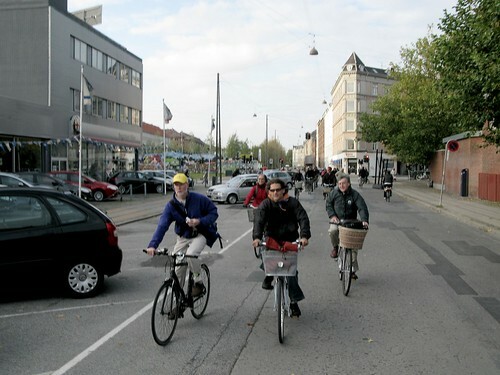 While in Copenhagen the group met with the city's Bicycle Department, the Transport Ministry and the Danish Cyclists' Federation. But not before we all went for an introductory bike ride just after they arrived. We rented bikes at Baisikeli, of course, where everyone got to choose they own style of bike. We did a huge tour of the major points of interest - regarding bike infrastructure - and while it's tricky leading 13 people on a bike ride, it was cosy and brilliant. On the last full day of their visit I took them on another long ride to visit the outlying suburbs and to take the train with our bikes. 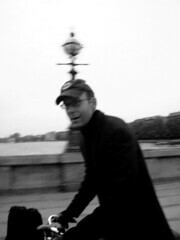 I rode my Yahoo Purple Pedals bike this time and it took photos the whole way. You can see a slideshow of the ride from the bike's Flickr photostream here. It was inspiring for me to meet such a great group of passionate individuals and to share experiences and knowledge with them.